Cindy & Justin — everAFTER magazine everAFTER magazine celebrates and inspires a couple’s journey from their engagement through to their wedding day and beyond including lifestyle and travel. Wedding venues, bridal, fashion and styling inspiration. "It was a day filled with traditions. A fusion of East meets West culture. A beautiful church ceremony was followed by a modern fairytale reception with fun and laughter, as well as delicious food and amazing desserts." The team at Blumenthal Photography captured the emotion and journey of the day. "We chose Blumenthal Photography because of the classic, timeless and natural way they capture moments. They were with us the entire day from the tea ceremony in the morning until the end of the reception." "Walking down the aisle with my step-father by my side was such a wonderful moment. He has always been the source of strength for my family and treated my mother, sister and I with so much love and kindness. I felt blessed for him to give me away. I will always remember seeing our beloved friends and family turn to smile at us as well as Justin's face as he stood at the end of the aisle waiting for me." After their wedding ceremony at St Patrick's Cathedral, Cindy and Justin made their way to their reception venue, Carousel on Albert Park Lake. "We arrived in time to catch the sunset over the lake." Guests enjoyed a 7 course Asian banquet. "The highlight was the fresh lobster with noodles." There was also a dessert table which doubled as the couple's wedding favours. There was a decadent selection of cake pops, brownie bites, salted caramel pots, personalised chocolate bars, macarons and cupcakes for guests to take home in takeaway boxes that read 'Love is Sweet, please Take a Treat'. A sweet tasting memory of the day! Cindy wore a Berta gown purchased from Raffaele Ciuca. The dress features a fit and flare style with a beautiful lace pattern. A modern version of a classic embroidered gown. "Justin and his friends surprised me with a serenade flashmob dance to Everytime You Cry by John Farnham and Human Nature. I have been a huge fan of Human Nature since I was 16 years old! It was hilarious and totally unexpected." "The theme for our wedding was 'Earthy, whimsical romance', as Justin and I both love nature and greenery. With the help of The Style Co. we were able to see this idea come to life." As Cindy and Justin's wedding took place in winter, they wanted to create a warm and magical atmosphere indoors for their guests. The colour palette for the reception was blush, rose gold, navy blue and emerald. "We had fresh pastel blooms entwined with green foliage and an abundance of candles all below a canopy of fairy lights." 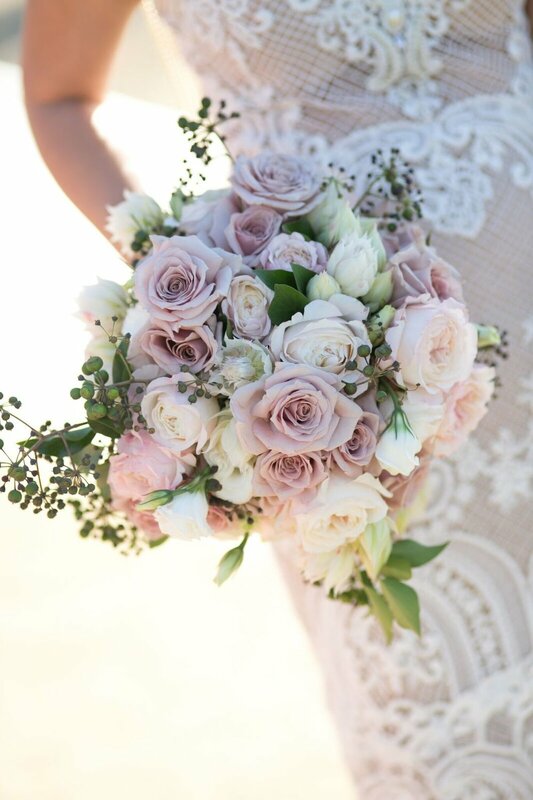 The flower bouquets were loosely structured with mixed pastel florals and pops of green. "We had flowers that were in season, which included antique roses, blushing bride, white double tulips, soft pink hyancith, lisianthus and white phalaenopsis orchids." White bentwood chairs complemented the soft grey linen of the tables. 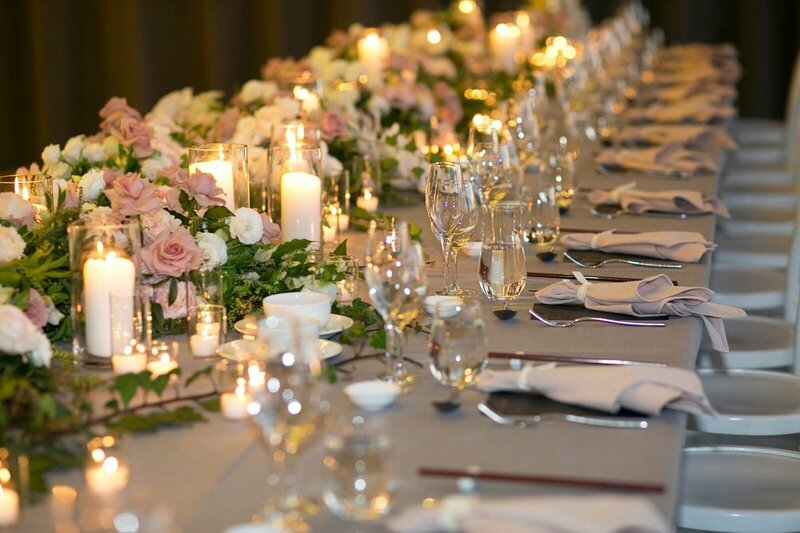 Each table was decorated with lengths of garland arrangements of pink and white florals with delicate foliage weaved between pillar candles and tea lights. Blush coloured napkins were finished with velvet ribbons and each guest received a navy coloured menu with their name printed in whimsical calligraphy. Carousel's foyer was given a free-standing navy wall which doubled as a seating chart. "Our names featured in copper creating a focal point and wild foliage spilled out from the text. 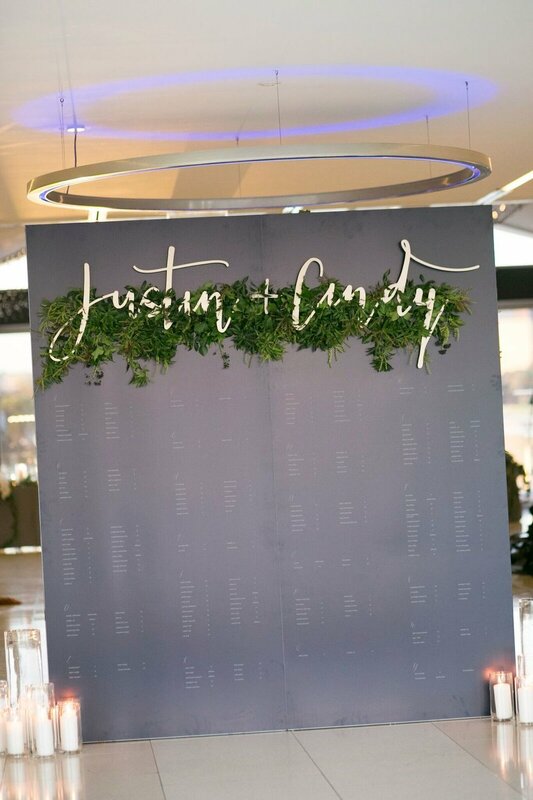 The reverse, blush side of our seating chart acted as a photo wall, with lush greenery detailing and our names in a cursive font." 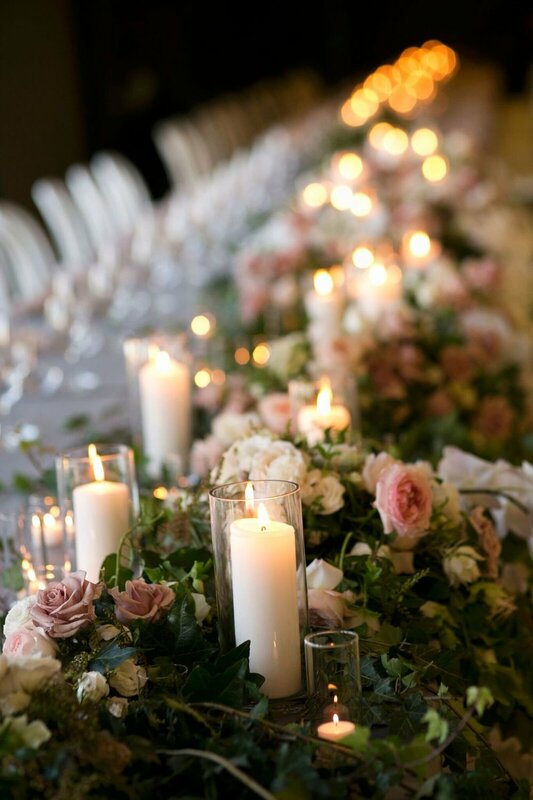 There were also clusters of candles in vases at the base of the seating chart which created a warm and inviting entrance feature and tea lights filled the alcoves of the foyer area. "Justin and I are planning to go on a European honeymoon starting with the beautiful Santorini. Neither of us have been to Europe, so we are looking forward to exploring together and visiting all the foodie places. Justin will be a trained Instagram husband by then!"